Preheat oven to 375F. Spray a 9″ tart pan with non-stick cooking spray. In a medium saucepan, heat oil over medium heat. Add garlic, onion and sage, stirring to coat with oil. Sauté for 3-4 minutes or until onions are translucent but not coloured. Stir in flour until combined, then gradually stir in milk and water. Bring to a boil and whisk until thickened, which will take 4-5 minutes. Add salt, pepper and nutmeg. Remove from heat and allow to cool slightly. Starting in a ring, allow potato slices to overlap and cover the bottom of the tart pan. Place half of the onion mixture on top and spread out. Add a second layer of potatoes, followed by the other half of the onion mixture. 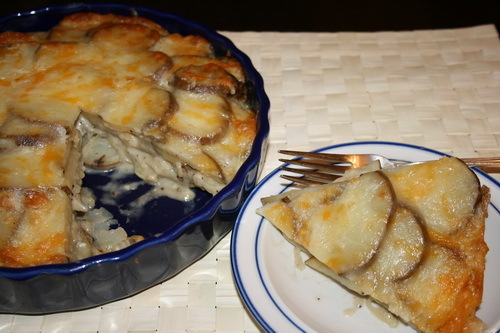 Finish with a layer of potatoes, then sprinkle the cheese on top. Cover tart pan with foil and bake for 45 minutes; remove foil and bake until cheese is slightly browned, about another 10-12 minutes. Serve immediately.